This week we are focusing on "good foods." Foods that are good for our bodies, that help us grow, and give us lots of energy and vitamins. Chef Combo--my puppet pal--came today to help me introduce all kinds of foods to the children. I am always so completely amazed at how enthralled the children are with a puppet. They saw me put him on my hand, and I am no ventriloquist, so they see my mouth moving, but they thought he was just a blast. Anyway we had lots of pictures of different foods and we had to decide if they were good for us or not. Afterwards we played a little game. I had gone "shopping" at home and had brought in a grocery bag full of food. I had then put up a happy face and a sad face. Each child got some food from the bag and they had to decide if it was good for you or not. If the food was good for you it went to the happy face. If it was not good for you it went to the sad face. They did pretty well with this. Finally our project was to make plates of good food. I had already cut out lots of food pictures from magazines. I do this myself because a) magazines are hard to cut, and b) it is a time saver. The children got a plate and glued their food to the plate. It's not a huge craft, but with the game and finishing our black bat--our time was filled. They do love their final creations though--they make sure they are allowed to take it home. Thursday is our big cooking day. Yummy! The book I read today has lots of foods in it, but it is actually a book about feelings. 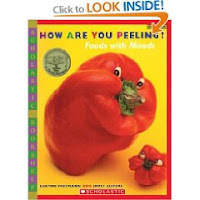 The book is called"How Are You Peeling? Foods with Moods," by Saxton Freymann and Jost Elffers. You will be amazed at what these people can do with fruits and vegetables. The pictures are gorgeous. I read the story, but mostly use if for the different types of foods in it. We also get to make lots of funny faces when they talk about the different feelings. If you have never seen this book, take a minute to look inside. 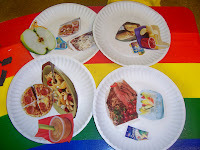 I think it is great that you are starting young with the kids and teaching them about nutrition. My kids became very intersted in nutrition after playing an Arthur PBS kids online game. It asks them to find a food that has vitamin C or Protein or Calcium, etc. They needed our help with this game at first, but now they are starting to understand more how foods can help the body. I call certain food "brain foods" and it has helped to get them to eat foods such as salmon. Luckily, they love blueberries- another brain food. Unfortunately, we know what there diet is including this week- lots of Halloween Junk! They are pretty good with me limiting it, though. Jen @ Creative and Curious Kids!